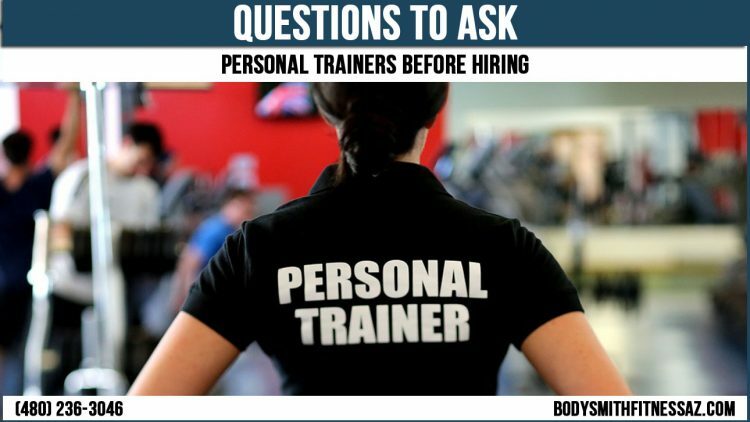 If you are searching for questions to ask a personal trainer before hiring, this post should help! So, you have finally decided to take that step in your fitness journey and begin working with a professional who is able to help you to reach your wellness and health goals. Not only will having support from a successful personal trainer keep you more accountable and more motivated when it comes to your weekly workouts, but they can even help you to maximize your time when you are at the gym, see more consistent results and prevent injury. However, there is a pretty fine line between simply throwing money out the window on something that will not work and making a sound investment in your future fitness. The main difference? Knowing how you can pick the right person who will help you to set the right goals and achieve your desired results. It is vital that you do due diligence as you go about selecting a personal trainer and all that it takes is a bit of legwork to find out if someone is going to be a good fit for your needs. That is why it is called personal training. It is because you are going to be working together closely which creates a bond that will help you to keep engaged and motivated during the whole process. There should be no hesitation here. A trainer needs to be able to show you a fitness certification for their area of expertise. In order to be certified, a personal trainer will have to pass an exam with an accredited organization like National Academy of Sports Medicine, National Strength and Conditioning Association and The American Council on Exercise. This helps to make sure that they have met certain standards for professionalism as well as competence from a trustworthy organization. Practice can make perfect, so a personal trainer who has been around the block a couple of times has likely tested and even perfected the process for providing the best cues to help you to be able to get the most out of every single workout. Unless you are okay with being a guinea pig, it may be best to resist the urge to make a deal with a newly certified trainer in favor of one who has some experience. What helps to motivate you? Some people do great with positive reinforcement mixed with some cheerleading, while others enjoy being scared and screamed at to do extra push-ups. Either way, you will need to talk to your personal trainer and check out their style to see if it is going to work for your goals. What Is Your Personal Training Philosophy? This happens to be a critical yet subtle point of differentiation simply because it can end up breaking or making your experience. How does your trainer develop their program, and what beliefs is it based on? Will it be done outside or is it gym-based workouts? Will you be using machines, or will you only use free weights? Ask about the training philosophy and see if it works for your preferences and goals. Have you ever heard that saying “The jack of all trades, but master of none?” If you have been looking for a specific thing such as hitting a 3k PR, then you will want train with a personal trainer who is specialized in running instead of someone who specializes in Olympic weightlifting. Not only will they have more expertise in the desired area of fitness, but the chances are that they will be more passionate about it if they known the sport and has an interest in it. How Much Do Personal Training Sessions Cost? Just like philosophy, experience and personality can differ between trainers, so can their rates depending on their certifications, location and specialty which means that sometimes the rates can be hundreds of dollars. So, before you ever start your hunt, take a moment to think about the budget you have. If you can’t afford to have a solo session, then don’t worry, there are some trainers that have semi-private sessions or will give you a discount for buying in bulk. When it comes to working with a personal trainer, consistency will be key. It is vital that you inquire about their schedule. How many clients does the trainer have such as being booked solid without a lot of wiggle room? Does the trainer like to book session at the same time every week, or is more of a floating schedule that can regularly change? How far in advance will you need to book a session, are you able to make up a missed session and what is the cancellation policy? This is going to be another area based on your personal preference, so you will want to consider your tendencies and habits. Are you willing to drive 20 minutes to the next town, or do you need a trainer within walking distance to keep motivated? Where do you like to train? There are some people who get their inspiration from seeing people in a gym setting, while others like 1-on-1 inside of fitness studios, and then there are some who like to work out at their home. The good news is that there is a trainer for each type of location. Can You Track My Progress? In addition to a personalized program that is based on your fitness level and goals, your personal trainer will need to have a method for tracking your progress so that you can see at increments that your hard work is actually paying off. Benchmarks like weight loss, PRs, strength gains and other types of achievements can help you to be able to stay on track and even make sure that your trainer is doing their job. The very best compliment that a trainer can get is a referral, but people being able to see the results of their clients is a close second. Being able to get someone to reach their goal, especially if the goal is close to what you are wanting to do, is going to be the best proof and great trainers will be happy to share with your success stories, references, and testimonials. However, you may be feeling a bit overwhelmed at picking a personal trainer, it is vital that you note that this criterion is just guidelines and not hard rules. If you feel really strong about some items and do not have a preference on other items, then it isn’t a problem. You are able to streamline your search by keeping this in mind: Trust your gut. You will want to look for an experienced and knowledgeable personal trainer who feels like a natural fit. That is the one to hire because they will help to motivate and inspire you, help you to reach your goals but also keep you feeling comfortable through the whole process. Looking For A Certified Personal Trainer In Tempe, Arizona? Body Smith Fitness offers fitness training and personal training in Tempe, Arizona. Get started with your fitness goals today with Body Smith Fitness.